Chelsea made it to the 2015 League Cup final after beating Liverpool in the second leg of semifinal affair took place during the midweek at Stamford Bridge. Now Jose Mourinho side will turn their attention to the much awaited weekend premier league fixture against realistic title rivals Manchester City which will be taking place at Stamford Bridge and this is one match where Chelsea can put their authority on the title race if they beat City and open up a 8 point gap at the top of the table. Since Chelsea played in the midweek for the second week running we might see a few changes against City in the starting lineup and we take a look at team news from both camps as well as our predictions for the game. Jose Mourinho has been reluctant to make many changes in his strong lineup and against Liverpool in the capital one cup semifinal he went with the strongest lineup possible with Diego Costa starting upfront on his own while Eden Hazard and Willian playing the wings in forward postition. While Cesc Fabregas, Matic and Oscar started in midfield roles. Gary Cahill was rested and Kurt Zouma was given a node alongside terry in the central defense with Filipe Luis and Branislav Ivanovic as full backs. CHELSEA TEAM NEWS (UPDATE): Diego Costa has been suspended for two matches after he was judged for violent conduct in the league cup game against Liverpool while Fabregas might miss the game against City with a injury he suffered during the same game which means we might see Ramirez starting in the midfield alongside Matic and Oscar. While Cesar Azpilicueta might start inplace of Filip Luiz did not have the best of games against Liverpool. Manchester City on the other had a five-day training break in Abu Dhabi last week and they should be fresh compare to Chelsea who has already played 3 games within a week going into City match. Man City are likely to start with Sergio Aguero in the starting lineup with David Silva playing just behind him. Yaya Toure and Bony will return from African cup of nations after their team got eliminated and Yaya Toure might slot back right into the starting lineup. Here is our prediction lineups of both teams. 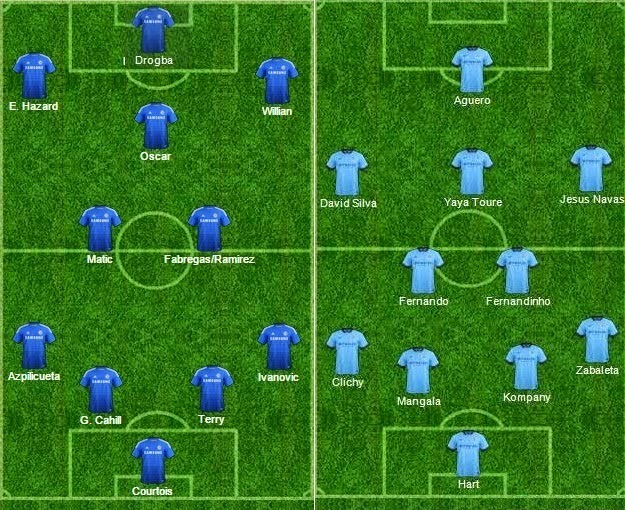 Here is how I expect both Chelsea and City to lineup this weekend for the crucial premier league match, which might make title race more interesting. But the confirmed lineup will be available 2 hour before kickoff. City seemed to got the better of Chelsea and November and December as they pulled a 8 goal lead to level on points but in last couple of premier league matches City has lost once and drawn the other which against opened up a 5 point lead at the top. This is a must win game for City as its pretty much a six point for them a defeat will get the Chelsea lead at the top to 8 points and a win will narrow the difference to just 2 points. 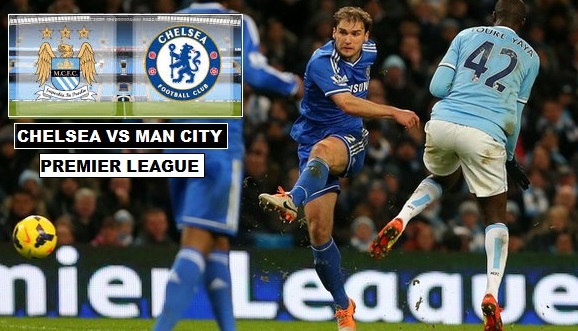 But City are looking shaky at the moment as it was shown against Middlesborough in the FA Cup. Chelsea do tend to perform better against City both home and away, Mourinho was not happy with Chelsea performances in the last week where they made hard work of Liverpool in league cup semifinal and lost against Bradford City having lead 2-0. So both teams are going through a patchy period but I can see Chelsea coming out on top with another Mourinho like performance where they will sitback and invite City into attack and try to get that counter attacking goal to seal three points. I am going with a 2-1 win for Chelsea.